For many patients diagnosed with a certain deadly type of brain cancer, the prognosis is bleak, with most living only 18 months after surgery. But now, researchers at Harvard University and the University of Michigan Medical School have developed what they say is a laser-based technology that may make brain surgery for glioblastoma multiforme cancer much more accurate. They technique would allow surgeons to distinguish cancer cells from healthy brain cells at the microscopic level, allowing them to remove more of the tumor and lessening the chance for regrowth. On average, patients diagnosed with glioblastoma multiforme live less than two years after diagnosis. Surgery is one of the most effective treatments for such tumors, but less than a quarter of patients’ operations achieve the best possible results, according to a study published last fall in the Journal of Neurosurgery. The new technique is called SRS microscopy, named after C.V. Raman an Indian scientist who co-discovered stimulated Raman scattering, which allows the measurement of unique chemical signatures of materials. In short, scientists can tell a lot about the chemical composition of material by hitting it with a laser beam and analyzing the spectrum of colors created. Building on Raman scattering technology, Sunney Xie, Ph.D., of Harvard University and the senior author of the new study, amplified the Raman signals by more than 10,000 times, making it possible to take multicolor images of living material. Using the technique, 30 images can be made every second, which is enough to make real-time video. This could potentially allow a surgeon to see the difference in tissue materials as the operation is taking place. On the left, the view of the brain that neurosurgeons currently see during an operation using bright-field microscopy. On the right, an SRS microscopy view of the same area of brain - in this case, a mouse brain. The technique was used to distinguish a tumor from healthy tissue in the brains of living mice -- and then showed that the same was possible in tissue removed from a human patient with glioblastoma multiforme. According to the researchers, SRS microscopy is as accurate as the most common form of brain tumor diagnosis, H&E staining. 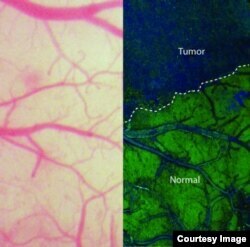 But unlike H&E staining, SRS microscopy can be done in real time, and without dyeing, removing or processing the tissue, researchers said. While the current SRS microscopy system is not small enough or stable enough to be used in an operating room, the team is working with the private sector on reducing the cost, stability and size. A validation study, to examine tissue removed from consenting University of Michigan brain tumor patients, may begin as soon as next year. The paper was featured on the cover of the journal Science Translational Medicine.